online, or you can call, or you can fax your orders in. 3/4"x3/8". This is a sew down, having a hole like a bead from top to bottom. Both sides are painted, so it can be used in either direction. 5/8"x3/8". This is a sew down with a hole through the body like a bead. Bluebird Sew Down. This has a hole, like a bead, going from top to bottom. Both sides are painted, so it can be used in any direction. 1/2"x1/4". 3/8"x3/8". This bunny is a sew down with a hole like a bead, running from top to bottom. Both sides are painted, so it can be used in either direction. Select color. 5/8"x1/2". This item is a sew down, having a hole like a bead running the length of the body. 3/4"x3/8" Like a bead, there is a hole from top to bottom for attachment. Both sides are painted. Specify color. Frog sew down. Has a hole, like a bead, running from the head to the back. Flat bottom. 3/8"x1/2". Hedgehog sew down. This has a hole running from top to bottom like a bead. 5/8"x1/2". Horse sew down. This has a hole running from top to bottom like a bead. 3/4"x3/4". Select Finish. 3/4"x1/2". This is a sew down, with a hole like a bead, running down through the body. Both sides are painted, so it can be used in either direction. Price is per bird. Choose body color. 1/4"x1/4". This is a sew down, having a hole through the body like a bead. 1/4"x5/8". This is a sew down and has a hole like a bead through the body side to side. 5/8"x1/4". 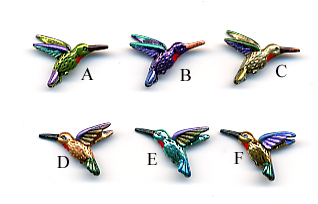 This is a hand painted bead with a hole through the middle of the bird - top to bottom. Both side are painted so it can be used in either direction. Scarab beetle sew down. Has a hole running from front to back, like a bead. Flat bottom. 5/16"x9/16". 5/8"x5/8". This spider is a sew down, having a hole through the body like a bead. 1/2"x1/2". This is a sew down, having a hole like a bead from top to bottom. Both sides are painted, so it can be used in either direction. Only 7 Left! 1/2"x5/8". This is now a bead with a hole through the center, head to tail. Will replace with a new scan soon. 5/8"x5/8" Turtle Sew Down. Like a bead, there is a hole through this item for attachment. For your shopping convenience, we accept MasterCard, Discover, and Visa on our Secure Server.